I was given a bag of homegrown cucumbers. They were not the tender and juicy ones like those from the supermarket. They were similar to this , a bit tough for salad and taken far too much space in the fridge. Had thought of making Malay acar (achar) but I still have few jars made a while ago. I wanted something quick and easy. 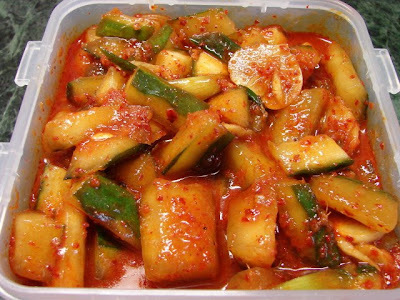 Thought of making stuffed kimchi (oisobagi kimchi) but these cucumbers some had overgrown, far too thick with grown seeds and the skin was a bit tough. Not going to waste this bag of cucumbers, I peeled half the skin off (zebra stripes), quartered lengthwise, trimmed off the soft core and cut into chunks. There was about 2.3kg after peeling,trimming and cutting. Then I just mixed the cucumber pieces with the pickling ingredients, leave at room temperature overnight then packed into containers before putting in the fridge. Best eaten after 2 days. Will keep for weeks. This kimchi may not be authentic but it's so simple and quite tasty cold with rice, congee or mixed with fresh lettuce and grated carrot as salad. I am quite addicted to it I even munch on its own like snack.